The Excelsior Project is a collaborative conservation effort on the Yuba, featuring 924 acres of wetlands, oak woodlands, gold-rush archeological remnants, and miles of critical riparian salmon spawning habitat. Here's a few of the stories the land has to tell. 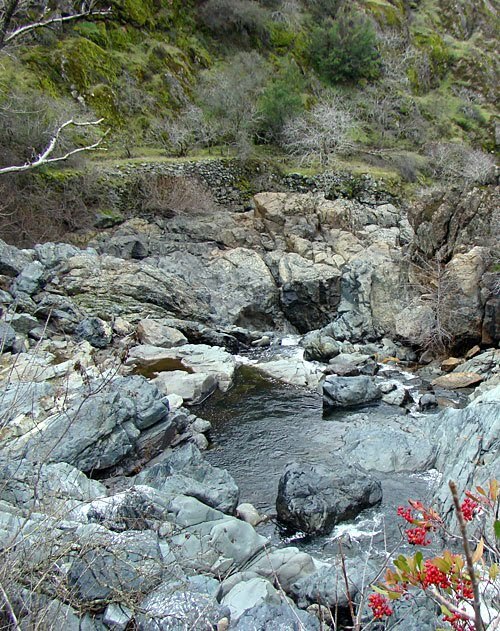 Along Deer Creek, about a half mile from its confluence with the Yuba River, a waterfall drops fifteen feet into a cold, clear pool. 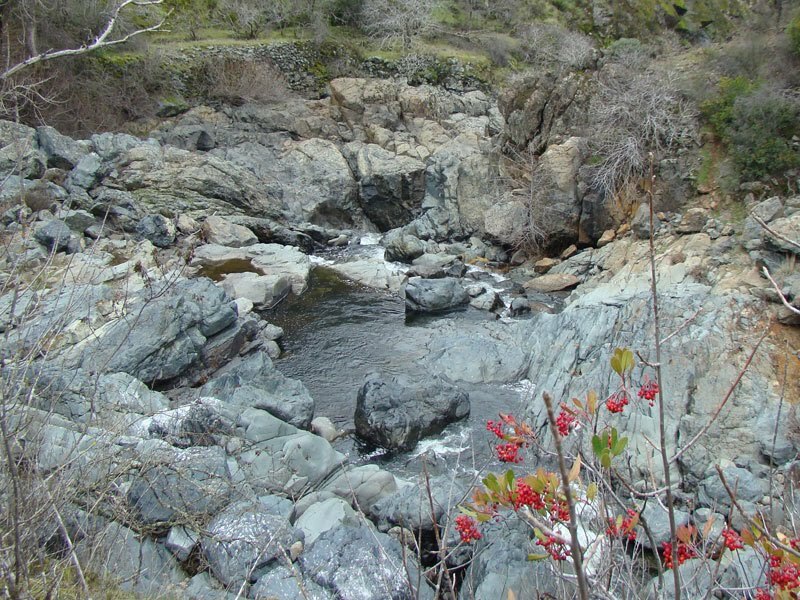 For salmon migrating up Deer Creek, this pool will be the end of their journey – that clear pool will be as far up the creek as they can travel. A faint, time worn trail leads up from the pool to a hill on the north side of the river, and from there follows Deer Creek upstream through the oaks, and countless bedrock mortars pock the boulder outcrops along the way. How sacred this pool must have been to the Maidu who walked that trail between the pool and their village, and who celebrated the Chinook salmon who returned every spring and fall to this very pool but no farther, their numbers stacking up till they packed the pool so tightly it must have been impossible to lower a net without pulling it back up filled with fish. One can almost hear the songs of thanks and praise that must have accompanied the salmon’s return and the feasting that followed. Along the river are relics of a later time, as well, with stacked walls of rock rising twenty feet and more from the water’s edge. Built with great care and enormous effort, these walls must have been the work of the Chinese laborers who toiled at the Black Swan hydraulic diggings. Opening into an overgrown swale above the walls is the mouth of the large tunnel through which the dynamited cobble and gravel of the mine was washed, the tunnel in which those Chinese spent their days standing in rushing water, raking cobble and gravel over the cut stone riffles which captured the heavier gold. The stone walls must have supported buildings, now long vanished, in which the gold was separated from the mercury and cementatious gravel in which it was bound. 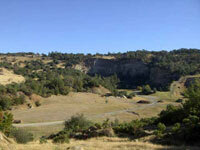 A little up from the creek are traces of the old stagecoach road which ran from Parks Bar, through Sucker Flat and Excelsior, then up Deer Creek to Mooney Flat Road, and from there to the diggings at French Corral. Numerous stone foundations, overgrown with oak and buckeye, jut out unexpectedly from the undergrowth and are some of the only traces of the community that once spread across this hillside. And now those miners have followed the Maidu into history, leaving little trace except for bedrock mortars and these stacked stone walls. Blue Point - What About the Gold? The miners only got to a small portion of the gold at Blue Point. They spent years washing away the upper layers of gravel before getting to the richer, gold-bearing material that lay in the lower portions of the ancient river channel, close to basaltic bedrock. They were just getting to the richest gravels when the Sawyer decision abruptly shut down hydraulic mining in 1884. And though the miners knew they’d only extracted a small portion of the gold that lay in that valley, once hydraulic mining ceased there was simply no cost-effective way to get to it. The gold was finer than sand, having been eroded from the upper Sierra by the ancient Yuba River, and was bound up in cemented river gravels so hard they had to be dynamited before they could be washed into tunnels by the hydraulic cannons. For every ounce of gold recovered, the miners had to blast away, on the average, more than ten tons of material. 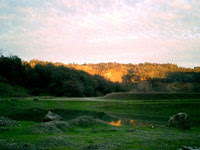 Given the vast quantities of gold-bearing gravel that lay in the valley, hydraulic mining at Blue Point was certainly a very profitable endeavor, but once the miners could no longer flush thousands of tons of waste rock per day through the tunnels and into the Yuba River there was no way they could process the quantities required for profitable mining. And so most of the gold still remains intact, cemented in the ancient river gravels beneath the valley floor. Though for the last hundred years or so a series of operators have tried to figure out how to get at Blue Point’s gold, most have gone bankrupt (and, according to legend, a few insane) in the process. 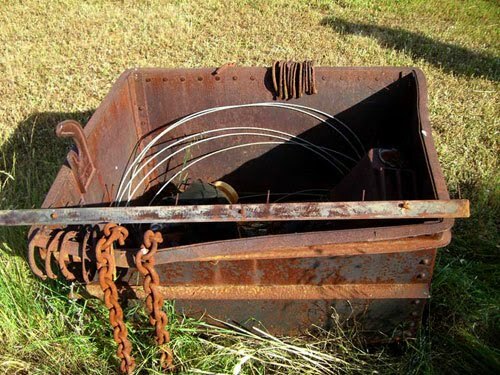 Although the Tarr Mine, with its ambitious aerial tram and stationary dredge, was by far the most grandiose, many others have attempted to “drift mine,” digging shafts down to gravels that might be rich enough to be worked profitably by a small operation. And more recent operators have tried to quarry the site, selling cobble along with the extraction of gold, but they went bankrupt as quickly as their predecessors. And now only the gold remains. 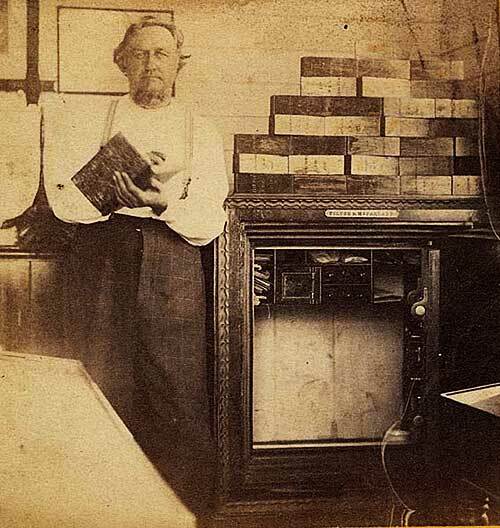 But are things different, now that the price of gold exceeds $1000/oz., the highest price in history? And now that newer, improved technologies are available which can more effectively extract the stubborn gold from the gravel in which it’s bound? Might now be a good time to consider a modest, surgical, even ‘green’ operation, tunneling down to the high-value gravels in the ancient river channel, extracting perhaps ten or twenty tons, not thousands of tons, per day, and leaving the surface, with its wetlands and wildlife and historic resources, undisturbed? And might the resources of such an operation be a means to keep the Blue Point property intact and preserved, and not otherwise developed or subdivided, until such time as a non-profit organization or public agency might be able to acquire and conserve it? Though a lot of questions remain to be answered, one thing is certain – the call of the gold beneath the Blue Point bowl is as clear and as compelling as ever. Farmers, environmentalists and fishermen praised the Sawyer decision of 1884, among the first federal court rulings on environmental protection. 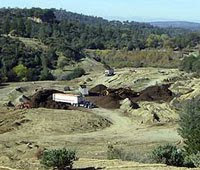 The court banned the dumping of silt, sand and gravel into the Sacramento River or its tributaries, effectively ending hydraulic mining. 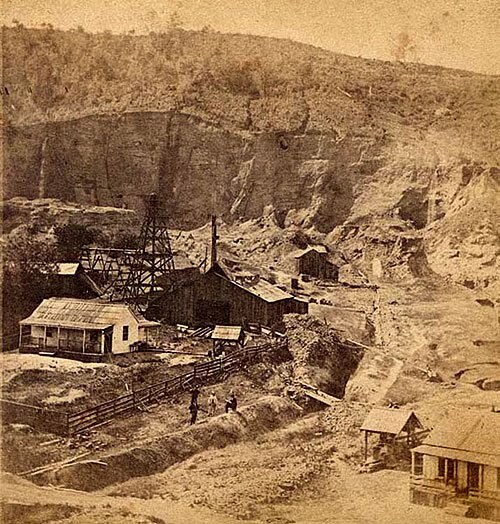 It was a crushing blow to the operators and investors who had sunk millions of dollars into mines from Sucker Flat up to the Malakoff Diggings. At Blue Point, after years of blasting and washing the northern half of Meade Hill through tunnels and across sluices and into the river, they were just starting to get down into the "gut" of the Blue Point diggings, where layers of heavy, gold-rich gravel rested close to the top of the basalt bedrock, a scant twenty to forty feet beneath the surface. So near and yet so far! And yet it was not possible to extract the gold without washing tons of gravel (about three tons of gravel per ounce of gold) in the process, and thanks to the Sawyer decision there was no way of legally disposing of the tons of gravel, and the thousands of gallons of silt-laden water that accompanied them. In the 1920s, E.H. Tarr thought he had figured out a way. He was a man from Boston, described by George Rigby as “very gruff with black hair and a beard to match” who brought the first automobile, a 1910 White Steamer, to Smartsville. He also bought a lot of investor money, and for a couple of years Smartsville and the Blue Point were a beehive of activity. He electrified the town (until that time, though the electrical lines that came up from the Colgate Powerhouse passed right through Smartsville, the town itself was still dependent on kerosene lamps for light) and at a cost of several million dollars erected an ambitious aerial tramway, mounted on 90’ towers, across the Blue Point bowl. 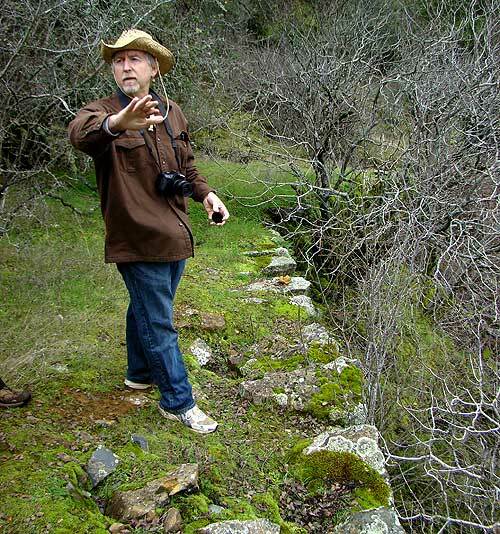 He brought in water through the Tarr ditch to drive the project – though the Excelsior Water Company claimed the right to all the water in the Yuba system, a court battle had established that the Tarr ditch, which had its headwaters on Wolf Creek, was outside of Excelsior’s monopoly since its source was in the Bear River watershed. 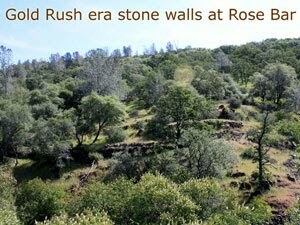 His plan was nothing if not grandoise: to use the tramway to dump the thousands of tons of waste gravel and cobble into the draw that crossed the Blue Point property, and place a “brush” dam at the mouth of the tunnel that drained the valley to capture the finer material and filter the water before it entered the Yuba River. 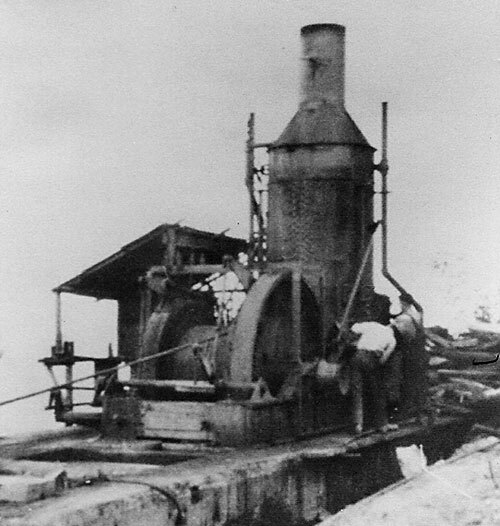 In addition to the tramway, Tarr installed a stationary dredger in one of the detention basins and a steam-engine powered conveyor belt to take the waste rock up to the tram base. It was a mammoth, costly, and, it turned out, short-lived operation. 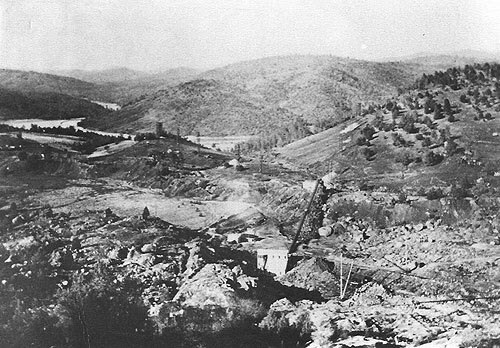 After years of construction the mine was in operation less than a week before heavy rains washed out the brush dam and flooded the Yuba with debris. The Debris Commission (the precursor of the Army Corps of Engineers who was charged with enforcing the Sawyer decision) stated that the operation must cease and desist until an approved dam, a solid dam built to bedrock, could be constructed. With the technology and equipment available at the time, and given the low price of gold, this simply was not feasible. 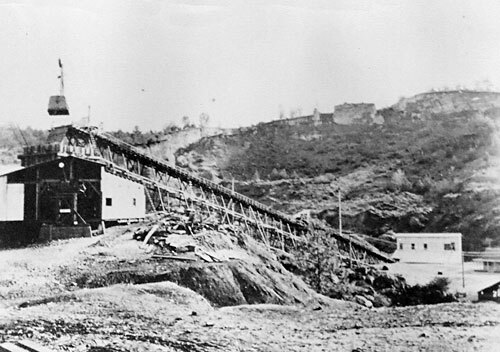 The Tarr Mine closed, E.H. Tarr went back to Boston, and his investors counted up their losses. 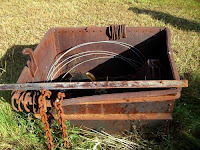 Today, precious little remains of E.H. Tarr’s grand endeavor. 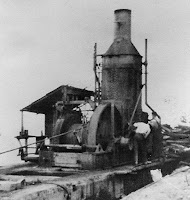 The concrete bulwark on which the steam engine was mounted still stands at the tunnel’s entry. The footings on top of which the four-legged towers stood are scattered across the landscape. A single tram bucket lies in the weather on a nearby property, and a length of cable lies amongst dried grass on a slope overlooking Rose Bar. 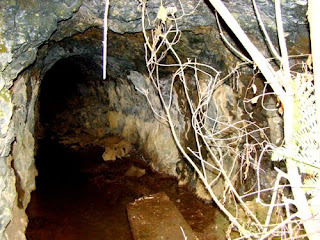 And most of that precious gold, which E.H. Tarr and his investors, along with generations of other miners, worked at such effort and expense to extract remains cemented in that ancient riverbed beneath the surface of the Blue Point Mine. 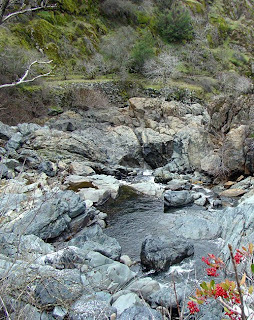 In the valley between Smartsville and the Yuba River lies the ancient bed of the Yuba River, where it ran for millions of years, laying beds of rich, gold-bearing gravel and cobble hundreds of feet thick before volcanic uplifts and basaltic lava flows forced the river north into its present course. It was these rich gravel deposits that captured the attention of the early miners, who realized there was more gold to be found dredging the cemented gravel hillsides south of the river than in the river itself. But the gold was not as concentrated as it was in the riffles and pools of the river itself – the gold in the hillsides was fine as talcum powder and locked into the rock-hard gravel cliffs. The miners soon found that to find gold, they’d need to move great quantities of earth; they’d need to form companies and blast the hardened hillsides with dynamite, and then wash the slurry with cannons of water piped down from miner’s ditches on the surrounding ridges across huge sluices where the fine gold, trapped by mercury, might finally be captured and the miners, two or three times a year, might finally be paid. 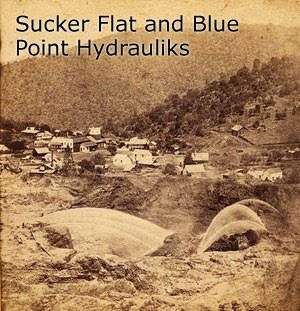 And so the great industry of hydraulic mining was born, and perhaps the greatest mine of them all was the Blue Gravel Mine, located at the great dog-leg bend of the ancient river bed, where the greatest quantities of gold were deposited and buried beneath over 300feet of cemented gravel rising up to form Meade Hill. 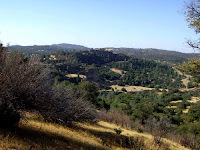 The Blue Gravel Mine was actually only one of six claims working the gravel channel between Smartsville and the Yuba River, along with the Enterprise, the Smartsville, the Blue Point, the Pactalos and the Pittsburg. Each of these claims had to bore its own tunnel north through the hard blue basaltic ridge to the Yuba River and it was in these tunnels that the miners, many of them Chinese, labored for long days in the dark, in knee-deep rushing water, raking the endless quantities of cobble and gravel across the sluices. The Blue Point’s tunnel was over 1,700 feet long and took over five years and $80,000 (a huge investment in those days) to complete. Not until 1863, after three years of operation, did they get down to pay dirt and begin to pay increasingly rich returns back to their patient investors, returns that continued until 1884 when the Sawyer decision, in response to the tremendous devastation being wreaked upon California’s farmlands downsteam, effectively ended hydraulic mining in California. The Blue Point Mine, however, continued operation until World War II, using a variety of creative methods to work the rich gravels without allowing (much) sediment to enter the Yuba River. The company brought water all the way from Wolf Creek outside of Grass Valley in the Tarr Ditch to circumvent the Excelsior Land and Water Company’s monopoly. 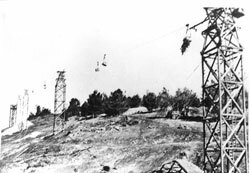 In 1920 an aerial tram was constructed at a cost of over $2,000,000 (a tremendous project for the time,) which was intended to spread the large quantities of waste rock over hundreds of acres, while a brush dam, constructed at the outfall of the historic tunnel at Rose Bar, would trap the fine materials before they entered the river. Unfortunately, after years of construction and within the first few months of operation, the dam collapsed, and the United States Debris Commission closed down the operation. For the next decade attempts at ‘drift mining’ the still-rich deposits, using hazardous tunnels to excavate down to pay dirt, were made, but not very profitably. Following World War II many operations attempted to work the deposits, for cobble, basalt, gravel and gold. 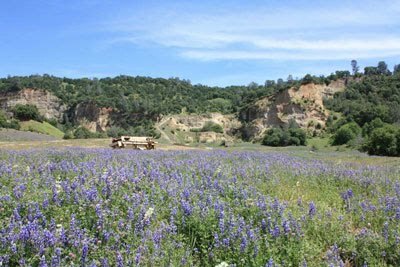 As recently as 2002, use permits were obtained from Yuba County to continue quarry operations, but in 2006 the property’s owners decided that the property’s real gold was in its historic, scenic, recreational and wildlife values. 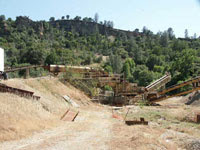 The site was revegetated and a reclamation plan for closure was completed and approved by the State Mining and Geology Board. After one hundred and fifty years of continuous operation, the Blue Point Mine is now silent. When we acquired the 500 acre Blue Point Mine property, the first decision we made was to close down the open pit gold-and-gravel mine which had been operating on and off on the site for about 150 years. Although the gold mine operation was both historic and at least potentially profitable – the bulk of the rich gold-bearing gravel on the site remains untouched – the environmental and aesthetic costs of open-pit mining were simply too great a price to pay. It turned out that closing down a historic mine is nearly as difficult as continuing to operate one. California’s Surface Mining and Reclamation Act (SMARA) requires the owners of properties with existing mining operations to commit to restoring the land to its original, natural condition – or at the very least, the condition of the land in 1972, which was when SMARA was passed. The State Mining and Geology Board, which enforces SMARA, has some very persuasive ways of ‘encouraging’ compliance with its regulations, which include fines for non-compliance of $5,000 per day, which definitely got our attention. And besides which, the goal, of restoring some of the environmental values back to this besieged and beleaguered site, was a worthwhile one. The first challenge of doing a reclamation plan was to figure out what our objective would be – that is, to what state did we intend to restore the property? 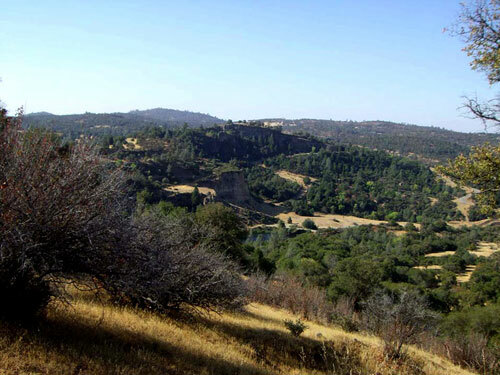 The goal of the large majority of reclamation plans is to restore a site to its pre-mining condition – which, in our case, would involve somehow rebuilding the half of Meade Hill which had been washed by the hydraulic cannons into the Yuba River. 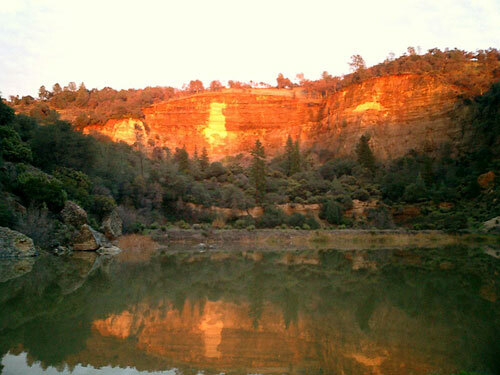 And besides, the cliffs and ponds and wetlands which have emerged in that landscape devastated by those early gold miners are not only dramatic and beautiful – to me they also told an important story, not only of man’s capacity for devastation but perhaps more significantly, of the planet’s innate capacity for healing and restoration. So we knew that we couldn’t restore the site to its “natural” pre-mining condition, nor did we want to. On the other hand, doing the minimal required of us by state law - restoring the site to its 1972 condition, when the quarry was in full operation and the site was scraped bare of topsoil and pocked with excavations and drainages - seemed not worth the effort, and would do little to resolve some of the erosion and other environmental and aesthetic problems that afflicted the site. We hatched a bold plan – to “resoil” the site, in effect covering over the hundred or so acres of bare gravel with a few hundred thousand cubic yards of brand new custom made topsoil, which could in turn support native grasses that hadn’t grown on the site since the first miners arrived, and that in turn could provide new habitat and forage for the area’s wildlife. It seemed like a crazy idea, but we had already had one of the major raw ingredients for topsoil on the site – a few hundred thousand yards of fine sand and gold dust, which had been stockpiled on the site throughout several generations of gold extraction. This would be the ‘filler’ for our topsoil – now all we needed was lots of organic material. 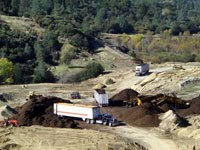 We contacted the green waste recycling operation at the Nevada County landfill, which as it turned out had a lot of organic material which was being trucked to plants in the Central Valley where it was being burned to generate electricity – and a lot of carbon dioxide in the process. They were looking for a more environmentally friendly way to dispose of their surfeit of green waste, and we were looking for organic material. It was a perfect match. 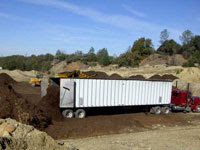 For six weeks, the Nevada County landfill moved their green waste recycling program to the Blue Point Mine, setting up an enormous grinder which took 20 large truckloads of organic material per day and ground it all into fine wood chips. Our tractors then took the mountains of fine wood chips and mixed it with the piles of sand and gold dust to create a soil blend that we then spread across the rocky, bare expanses of Blue Point. Then the hydroseeders came in to “top off” our custom-blended soil surface with fertilizer, native grass seed and erosion-controlling mulch. And then all we needed to do was wait for a little rainfall. That spring, the valley floor turned green for the first time in a 150 years. The inspector from the State Mining and Geology Board called it the finest reclamation effort he’d ever seen. The deer and birds we saw browsing the now-verdant landscape seemed to agree. And after all the insults and abuse that had been afflicted by the hand of man on this noble landscape, it felt an honor to assist, in some small way, in the healing process. In September, 1849, a company of fifty men, among whom was William H. Parks, commenced to dam the river, so as to mine the bed. They completed the dam, and commenced work early in October. The rain set in on the eighth, and in two days the water overflowed the dam and washed it away. In the few days' work they had taken out one thousand dollars each. A few days before the destruction of the dam, Mr. Parks sold out, and with an experienced baker started a store, bakery, and boarding house. During the year the bar became very populous, and in 1850, there were two thousand men working here. At that time there were three stores, one of which was kept by Baker & States, three boarding houses, two saloons, bakeries, blacksmith shops, etc. The course of the river was turned seven consecutive years, the last time in 1857. But little work was done here after that, and now the bar is covered by tailings from the mines, many feet in depth. When the high water came during the winter of 1849, the miners moved back into the ravines, where they found very rich surface diggings. 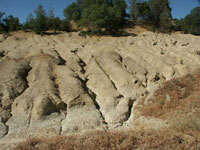 Squaw creek was a very rich locality. from Thompson & West's "History of Yuba County" - 1879. The latter name was given it because Gates was a native of Illinois. A store was started here that winter by a man named McCall. Rose Bar was on the river and Sucker Flat just back of it, the two places being practically one. In 1851, the joint population was three hundred men and five women. The nearest post-office was at Parks Bar, a few miles below and on the opposite side of the Yuba river. Rose & Reynolds closed out their business in 1850. L.B. Clark had a store at Rose Bar also. 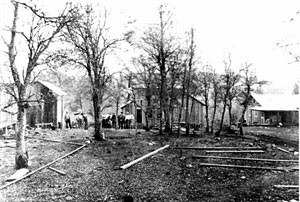 When the bar began to be worked out and the hydraulic mines were developed, Sucker Flat became quite a town, and Rose Bar was abandoned. Daniel Donohue purchased McCall's old store in 1853, and a few other stores were started. In 1858, a fire destroyed Donohue's store, several other small stores, and a great many dwellings. 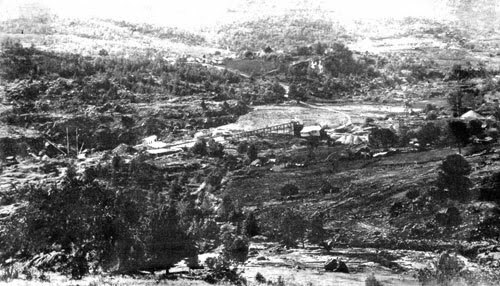 Rose Bar is now covered up with tailings from the mines, and Sucker Flat is simply a place of residence for the men who work in the hydraulic mines. There are now three small saloons, two boarding houses, and from fifty to sixty miners' cottages. The population is about three hundred. Smartsville is now the base of supplies for the people of Sucker Flat. A husband (to Ellen, 30 years & counting!) and father (2 girls, Emily 25 and Elsie 19,) A landscape architect and land planner. Passionate about conservation and community. Love to write, love to ski and love live music. I live on 11 acres outside of Grass Valley surrounded by oaks, deer and turkey. Sometimes I think it's too much work, mostly I think it's right where I want to be.